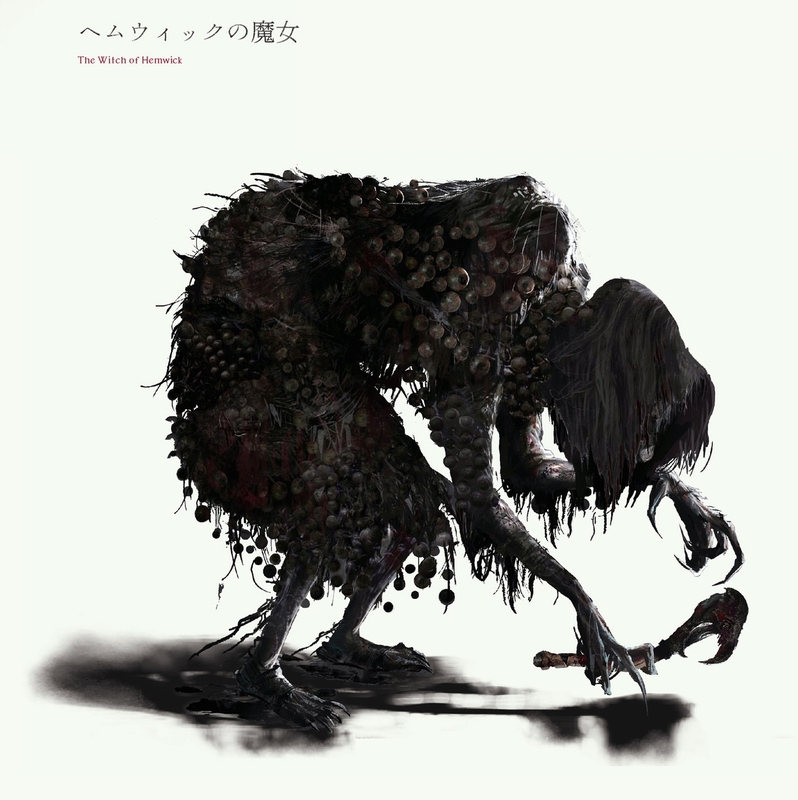 The required bosses must be killed in order to finish the main game story and to proceed to the new game plus and further, whereas the optional ones may be avoided. In the outskirts of Yharnam, the city of gravekeeper witches carved by the sunlight, Hemwick. In its depths, an old, gigantic structure and one Old lady lies in wait. Holding suspicious rituals in the deepest of the night, for that very purpose it is said that she gathers the eyeballs of the living. In the city where unwanted corpses would be gathered and disposed of, her outfit might just be befitting of one such place. Hemwick graveyard, located on the outskirts of Yharnam. Despite the warm coloured sky and beautiful clouds, this graveyard is home to some very twisted residents, like the deformed gravekeeper hags with their horrifying shrieks and long reach attacks. When you make your way through the depths of the Hemwick graveyard, you’ll come upon an old manor inhabited by a powerful eyeball-collecting old witch, among other things. Night after night, this old woman loses herself in a strange ritual. Supposedly because of this mysterious rite, she has taken to collecting eyeballs, which she proudly wears for all to see. Be sure you've obtained the Radiant Sword Hunter Badge from the Healing Church Workshop to make Bone Marrow Ash available for purchase from the Bath Messengers in the Hunter's Dream. 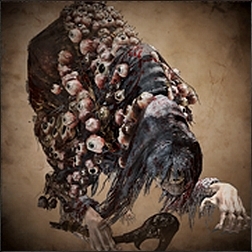 Stock up on Blood Vials, Quicksilver Bullets and Bone Marrow Ash; if you've already acquired the Powder Keg Hunter Badge from Djura in Old Yharnam, buy a full load of Oil Urns as well. Finally, if you've picked up any Numbing Mists and haven't used them yet, this is a good time to add them to your Quick Items; this measure is optional, but can provide a helpful advantage during the battle. Although the witch herself is weak and straightforward for a boss enemy, she uses several diversionary tactics to complicate the fight. During the first Phase, the witch you'll face is actually a doppel-ganger; the real one will not join the battle until the clone's health falls below 50%. Both, witches are invisible outside a narrow radius of two to three meters; moreover, the real witch's health bar will not be displayed at any point during Phase 1, even after she joins the battle and begins taking damage. Each witch will always begin the battle in a fixed position: the clone starts off in the comer to the left of the entrance, while the real witch will appear in the opposite corner to the right of the exit. Neither witch is especially aggressive during this Phase;, most of the time they'll slowly wander the perimeter of the room and completely ignore you, but will occasion ally perform a single melee attack or their Dark Wave if you get too close. They will teleport away from you after being hit, usually to the opposite end of the room or onto the walkways, and will continuously summon Mad Ones up to a total of four. These Mad Ones have extremely short detection range and move very slowly during; Phase 1, but can become a serious problem if they corner you. Phase 2 begins when you reduce either witch's health to 0. At this point you'll have 50 seconds to defeat the remaining witch before the first one stands back up with 20% health. Both witches will begin bombarding you with repeated Paralysis Blasts during this Phase and will immediately follow up with their Eye Gouge while you're stunned; they will also summon Mad Ones more frequently and will continue using their Dark Wave attack at mid range. The Mad Ones' movement speed and detection range will increase during this Phase, and they'll become more aggressive and persistent in hunting you down. Reduce both witches' health to critical levels during Phase 1 and keep careful track of their positions to finish them in quick succession and completely bypass the battle's second Phase. Their incredibly slow movements during the first Phase allow you to stagger them consecutively with charged strikes and trap them in a chain of visceral attacks until you run out of stamina; alternately, you can power up your Cannon or Flamesprayer with Bone Marrow Ash, strike one of the witches from behind with an oil urn, stagger her with a charge attack before she teleports and blast her during the stagger state for heavy damage. Hitting the witches with Numbing Mist surrounds them in a white cloud, which can be used to track them from far away. If you're having problems with the Mad Ones, you can enter the fight with 0 Insight and they will not appear. Note that the first time you enter the fight, you'll be granted 1 Insight and will have to spend it for this to work. The partially-collapsed bridge connecting the outer walkways effectively divides the room into two square halves, though you can move freely between them through the broken section in the middle. Running on the walkways generates loud noise that will immediately alert any summoned Mad Ones to your exact location no matter how far away they are; you can prevent this by tilting the left analog stick gently to walk, but it can also be used to lure the Mad Ones onto the walkways and away from the witches if you need more room to fight. Defeating the witch will open Bloodshot Eyeball for purchase at Insight Bath Messengers. During The Witch of Hemwick grab attack animations, damage can NOT be reduced by repeatedly pressing buttons (mashing). 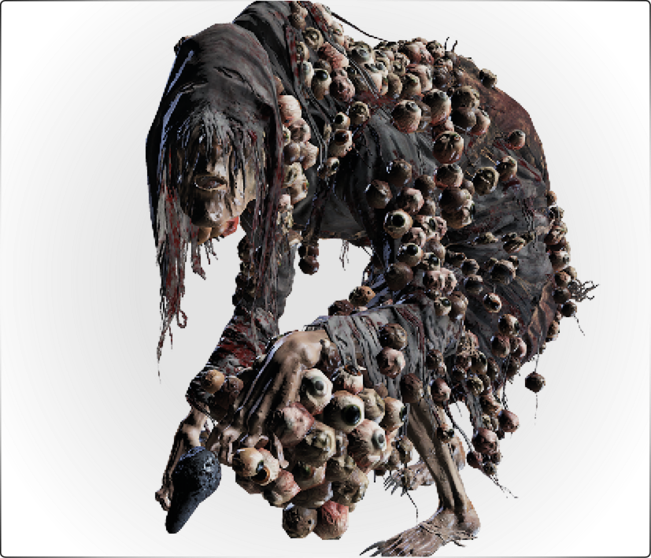 Witch of Hemwick will keep summoning Mad Ones if you have at least 1 Insight (for boss encounter), if you have 0 Insight no Mad Ones will be summoned. Defeating the Witch of Hemwick grants you access to a cell where you can pick up the Rune Workshop Tool. Witches of Hemwick can damage each other with their attacks and subsequently are able to kill each other. Shaman Bone Blades don't affect this enemy, making the item ineffective. 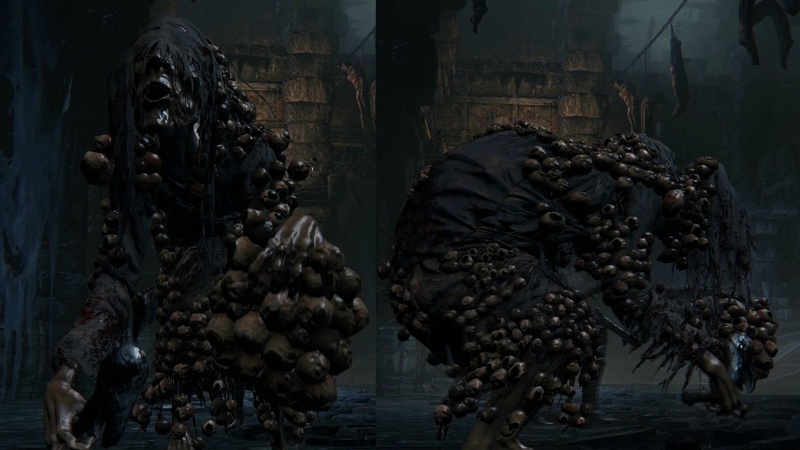 Having a summoned ally doesn't alter the health or difficulty of the enemies you'll fight, but it does affect the bosses. To ensure they are still a challenge, boss health, showed in table above, is increased to 1.5x when a second co-op player enters your world, and to 2.0x when a third enters. Dark Wave No Spherical attack with a two-meter radius; quickstep forward through it or backward to escape. Summon No Summons up to four Mad Ones in quick succession; shoot or attack the witch to cancel the summoning. Phase 1 Strategy: Walk far enough into the boss room to initiate the fight, then turn left and engage the doppelganger witch. You may use any desired means to fight her, but chaining visceral attacks is the quickest and most effective way to deal damage. Keep an eye on the Mad Ones and run up the walkway to divert them if you need more room to fight; if you drop down from the longer half of the broken bridge spanning the arena, every Mad One in the room will move slowly to that spot and then lose track of you provided you don't enter their detection range before they get there. The witches' melee attacks and Dark Wave can damage the Mad Ones, but don't count on them to use either one - most of the time they won't attack at all. If they do use their Dark Wave, either quickstep toward them just before they cast to negate the damage with your invincibility frames or quickstep backward as soon as possible to avoid the attack entirely. Reduce the clone's health to around 20% and memorize her current location, then head for the far end of the room and track down the real witch; if you haven't already attacked her, she'll still be wandering around near the exit. If you have any Numbing Mists, hit her with one before attacking so that you can track her location; otherwise deal as much damage as possible using any of the Key Strategies before she can teleport away Focus on defeating the real witch first and when she falls, immediately return to the doppelganger's position and finish her off before she has a chance to initiate Phase 2. Paralysis Blast No Long-range projectile that paralyzes; followed by Eye Gauge if it connects. Roll or quickstep sideways. Eye Gauge Yes Running grab attack used after a Paralysis Blast. Unavoidable if paralyzed; otherwise quickstep sideways. Phase 2 Strategy: If you're unable to defeat both witches before this Phase begins, you'll have to deal with their Paralysis Blasts and constant attacks from more aggressive Mad Ones. Using the walkways to draw the Mad Ones away from the witches becomes much more important at this point, but the barrage of paralyzing magic will make it dangerous to stay in one place for too long. You can use the terrain and even the Mad Ones themselves to block these projectiles; you can also use the projectiles to get a fix on the witches' locations. Apart from the increased pressure and less frequent opportunities to safely attack the witches, the overall strategy during this Phase remains the same: reduce their health to critical levels and strike them down at close intervals to bring the fight to an end.